Disclaimer: This article contains spoilers for Bodacious Space Pirates. 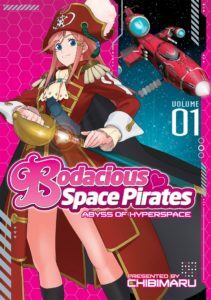 When I happened to come across the title Bodacious Space Pirates, I was definitely interested. It’s pirates! In space! And they’re bodacious! What’s not to like? 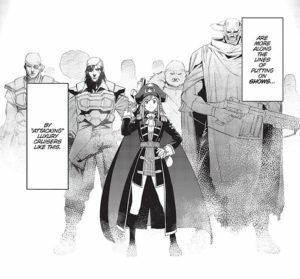 After reading both volumes, though, I found the bodaciousness of these space pirates to be rather, well … not. 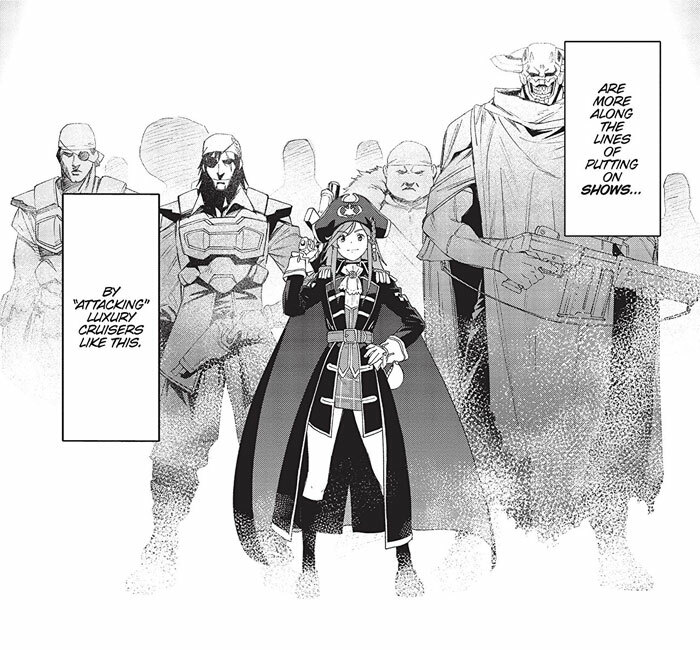 The main character, Marika, is the captain of a space pirate ship. In these futuristic times, the galaxy is at peace. As a result, “space pirates” are less involved with actual piracy and more so involved with glorified performers who “attack” luxury cruises to give the rich clients the thrill of being attacked by pirates. Marika is not just a space pirate; she’s a student in high school who keeps up with her studies on her days off (I guess). Being a minor also means she has a strict curfew, so every day at 9 p.m. sharp she leaves the ship and heads to … whatever planet is nearby, presumably. I kept waiting for this bit of worldbuilding to make sense (what happens if she’s not near her home planet? What happens if she’s actually attacked by unfriendly forces? ), but it never did. The “she’s also a student” plotline serves to introduce us to the members of her (space) yacht club, a plethora of characters who have some jobs to do in the plot later, but ultimately don’t get enough screen time or distinct purpose to justify their existence. Out of eight or nine characters, only two or three have an actual plot-driven purpose. Because there’s so many of them floating around, it’s hard to tell them apart enough to be sure. After some confusing meandering through piracy and yachting, we finally get to the main plot where we are introduced to a boy named Kanata. Kanata, while being chased by military-esque forces that might actually be threatening, is “kidnapped” by Marika. It turns out that their fathers (the previous captain of the space pirate ship and a famous hyperspace scientist, respectively) knew each other, so she offers him shelter from the somewhat unfriendly people chasing him. 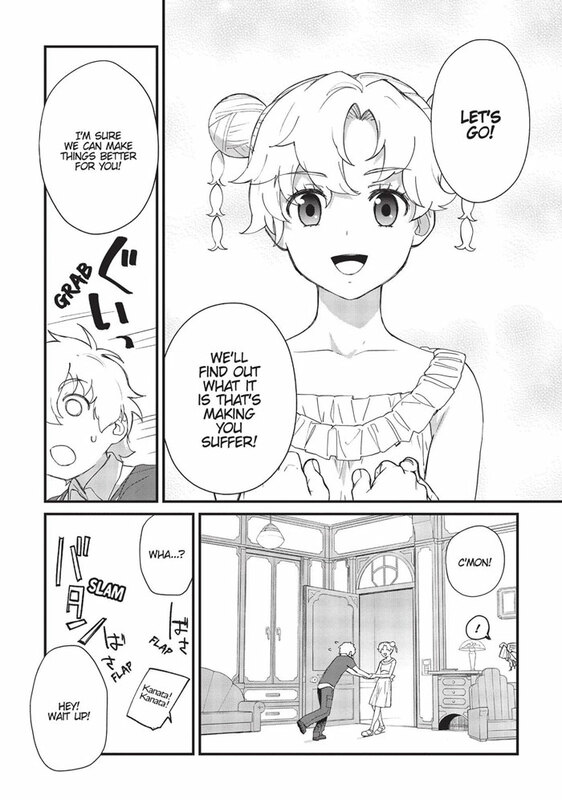 Kanata’s goal is to choose his own path in life, which—spoiler—ends up being exactly what his father wanted him to do. With the whole “dangerous plot put on hold because of a curfew” thing and the “piracy is just a stage” thing, it’s hard to get a sense of actual danger from the unfriendlies chasing them. They blow up her house, but she wasn’t anywhere near it at the time (it’s played more for laughs). To thwart them, the members of the yacht club end up running hacker rings around this supposedly powerful supercorporation. Since nothing ever feels really dangerous, the villains feel Team Rocket-esque; thus, the actions of the kids outwitting them doesn’t feel spectacular either. Meanwhile, Kanata and Marika are tracking down the MacGuffin that will let him follow in his father’s footsteps. This involves a puzzle connected to their fathers and their fathers’ old friends (who are never mentioned again). The climax comes as the two groups conflict (it’s hard to call it an actual fight) and Kanata slips away to poetically go see the color of the source of hyperspace. This has the more practical effect of opening up a new hyperspace lane. Hyperspace is open to anyone that has a ship, so it’s still unclear as to why the supercorp was trying to get their hands on Kanata and his MacGuffin so relentlessly that it ends up ruining their company. “Unclear” is a description applying to both volumes of the series. It’s likely this series, only two volumes, was cancelled before the writer intended, which often does cause problems with pacing toward the end. The scope of the worldbuilding and plot here was way too ambitious for a series of even a longer size. If a series needs more than two volumes to explain some of its most basic premises, there’s a problem with the storytelling. I wonder if confusion with its original audience is why it ended after only two volumes. That’s not to say it’s all bad, though. If you’re in the mood for a lighter, low-tension read, this is definitely going to fit the bill. The series does succeed in capturing the romance and free-spirited nature that readers associate with fictional pirates. Furthermore, the character moments—when we get them—are pretty nice. 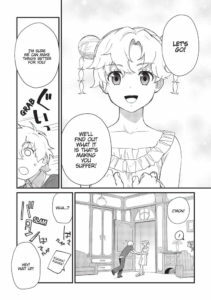 There’s a few pages dedicated to a budding friendship between Kanata and one of the clone princesses that I really wish they would’ve dug deeper in to. It can be tricky to take something that’s a long light novel series and turn it into a short film or manga, but it can be done. Cutie Honey a Go Go! and The Count of Monte Cristo are two adaptations that work very well within their page constraints. What worked well with those is that the writers were able to figure out what kind of story they wanted to tell (an origin story for Cutie Honey a Go Go!, and a tale of revenge versus forgiveness for The Count of Monte Cristo) without letting the excess details bog it down. 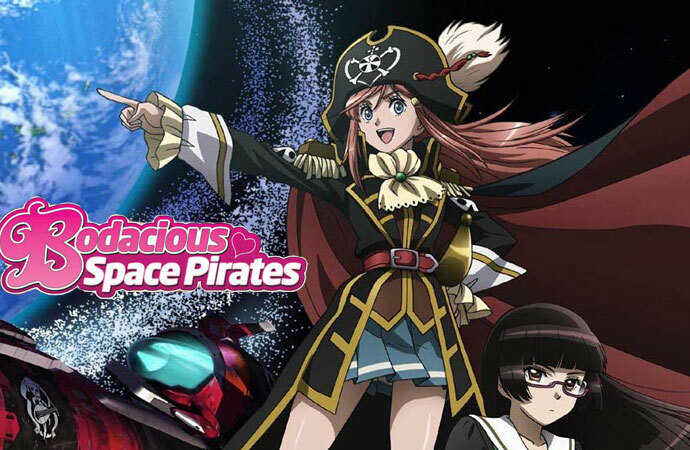 What kind of story was Bodacious Space Pirates trying to tell? I’m still not sure.